We wonder if Sammy did a “twirl” like Kramer did on Seinfeld. Hi everyone! Look at all the goodies I won at Cat Scouts. All I did was guess correctly on which horse would win. I guessed #5 because Mom made this photo of me on Faceinhole.com and I was on horse #5. Isn’t that cool? This can of goodies is like a TARDIS, much bigger on the inside. I can’t believe how many goodies were in this can. Look at all this loot- there were 3 packages- silvervine, valerian and premium catnip. Plus a birdy that sounds just like a real one ( Jinx caught it and delivered it to Mom). There was a ball and a spring and a tin of kitty mints and a laser and a hexbug and a pouch of food too. Thank you Denmaster! I promise to share- eventually. The good news is your folks can get you your very own Hooligan in a Can too from Cat Scouts. You don’t have to be a Cat Scout to order one, but Cat Scouts is lots of fun and open to boy and girl kitties, any age , from any country and you don’t even have to have a blog. To be transported to Cat Scouts to order your own Hooligan in a Can just Click Here. And who knows, you may meet that special someone at Cat Scouts like I did with Maggie. Hi everyone! It has been quite some time since we have had a guest post from our friends, Cat Scouts Maggie and Felix so we are thrilled to have them today. Greetings, everybody! We have missed visiting, so we are very excited to tell you about a new Turkish film, “Kedi,” all about the famous cats of Istanbul. For centuries, the city’s residents and visitors have befriended the thousands of cats, fed them, and sometimes provided shelter and veterinary care. Even President Obama was photographed petting one of the kitties during his visit to Turkey a couple of years ago! “Kedi” not only follows the activities of selected street cats, but the film also highlights the importance of the animal-human bond in an historic city undergoing massive development and population pressures. We can’t wait to see this film, and hope it comes to a theater near you! If not, you can download it on Vimeo. Just “google” Kedi download. Thank you Maggie and Felix. We also want to join Athena’s Caturday Art Blog Hop. Phoebe wanted to see how she would look on the big screen so she went to Photofunia to make this. Hi everyone! We are joining Athena’s Caturday Art Blog Hop. Phoebe went to Faceinthehole.com and made this to celebrate The Kitten Bowl. Our friends, Cat Scout Maggie and Cat Scout Felix told us about a great program that will give 2 scholarships to graduate students studying the human/animal connection. You can make a donation in someone’s name for Valentine’s Day. If interested, Click here. Hi everyone! We are very lucky to have a guest post from roommate Cat Scouts Maggie and Felix. We wanted to take this opportunity to thank Auntie Ellen for inviting us to guest post once in awhile. We love sharing our common concerns about animal welfare, and especially kitty news and trends. We are taking a much-needed break from the holidays, and we’ve made a few New Year’s resolutions. We know with Winter in full swing in many parts of our country, our compatriots without homes are struggling to stay warm and find food and water. We and many of you donate supplies and money to our local shelters and rescue groups, but we’d like to also encourage you to volunteer to help your community care for our needy relatives. If you are unable to donate time or money, but like to “socialize,” you can always help on-line with petitions, drives and message boards. You’d be surprised at how effective our combined paw power can be! We wish all of you peace, good health and lots of love in 2017! It is called Lighting the Way for Easy and is hosted by Dory’s Backyard. Hi everyone! We are lucky to have Cat Scout Maggie here this week with a guest post. Greetings everyone! This week I’d like to introduce you to a wonderful organization dedicated to the animal-human bond. It is the Animals and Society Institute, based in Ann Arbor MI. Those of you interested in animal issues should check out their website. I’m attaching part of their mission statement and other information. Michigan State University Animal Legal and Historical Center offers a comprehensive list of federal statutes relating to animals and those who work with them. Felix and I pawticularly like this institute, because they address head-on the issue of animal abuse and how to combat and prevent it, starting with youth education. Not a pleasant topic, but really impawtant in our humble view! Thank you for another great post Maggie. 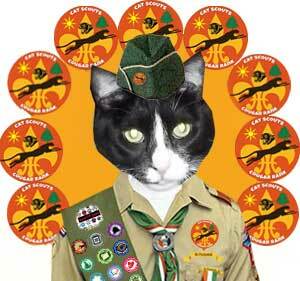 And we hope you don’t mind, but Sammy wanted to show off the photo from the Cat Scouts trip. The way he climbed up the side of it, I think he watched The Notebook too many times with my niece and I.
Hi everyone! 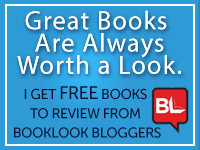 We are lucky to have a guest post today from Cat Scout Maggie. Howdy everyone! Like most peeps and kitties we know, you are probably getting into the political swing! Convention last week; another one this week. There are so many impawtant things for our peeps to think about when choosing a favorite candidate, but I’d like to urge all of you to persuade your humans to check out the humane/animal awareness records of their state and local candidates. Many federal laws that protect animals and advance animal rights start at the local and state level. Tell your peeps to check out the voting and legislative records of their candidates. Did they vote or advocate FOR or AGAINST us and our fellow furry friends? Voting for animal-friendly candidates will help advance the cause of animal protection and animal rights in your area, and can spread to other areas. Some states are even considering awarding “personhood” status to animals so that in instances of custody, control or prosecution, animals that have been victimized or abused will have the same rights as humans. Let’s meow to our peeps to get informed and involved!! Thank mew all! Please stay cool and well hydrated, especially as the election season heats up!! Hi everyone ! We are lucky to have Cat Scout Maggie here today. Today I’d like to share with you some information our mom brought back from the recent Taking Action for the Animals conference in Arlington VA, hosted by the Humane Society of the U.S. This biennial conference brings peeps from around the world to discuss the latest tools and techniques for making our world a more humane place. Two trends this year that were bigger than last time around: more people are embracing the Vegan lifestyle; more wildlife sanctuaries from around the world are getting financial support and publicity. My interest was in the Alley Cat Allies information! As you know, they are a very proactive group which advocates on behalf of community cats; informs public policy and institutions so that our feline brothers and sisters have a better chance to live out their lives, and corrects many misconceptions about spay, neuter, community cats and the peeps who care for them. If you are involved with a rescue group, or are trying to start a community cat sheltered area, Alley Cat Allies has a wonderful website filled with tips, resources and peeps you can connect with. They are there to encourage and help you! Kitten care is a huge effort. ACA is working with local shelters and rescue organizations to start kitten care programs which use the “Wait Until 8” slogan. Kittens found or turned in to shelters can be fostered and provided with formula, bottles and information kits. Once they reach their 8th week, they are ready to to back to the shelter, be spayed or neutered and adopted out. Without this type of program, many kittens are euthanized because shelters simply don’t have the room or the resources to care for the huge numbers that show up every Spring. ACA also intervenes on behalf of chained cats by providing or working with others to install a Purrfect Fence which protects the cats in an airy and safe enclosure that enables them to move freely and yet not escape. These fences would be great in your backyard, too! Another effort of Alley Cat Allies is working with local and state governments to adopt Trap/Neuter/Return policies. These ordinances include protections for community cats and their caregivers, and also prevents ear-tipped cats from being admitted to shelters. Ear tipping identifies cats as having been spayed or neutered, and should alert shelters that these cats probably belong to a community and do not need to be held in a shelter where they might likely be euthanized if not quickly adopted. ACA also advocates on behalf of cats in other countries. Recently the government of Australia announced it would cull and kill 2 million cats by the year 2020, in order to save endangered wildlife. They plan to use poison and other inhumane methods. You can sign a pledge calling for Australia to address the real threat to its wildlife – the destruction of their habitats. Visit alleycat.org/Australia to sign the pledge! Alley Cat Allies is holding its 16th annual National Feral Cay Day on October 16 of this year. If you would like to pawticipate, visit NationalFeralCatDay.org You can sponsor an educational program or community effort right where you live! Please get involved and help save our fellow felines!! On a last note, many of us know a kitty that may have gone missing and has not yet returned to its home. If your cats go outdoors, please have them micro-chipped! This could save their life. Collars and I.D. tags can often come off or be removed by others, and then your cat loses his identify. Microchipping enables cats to be easily identified by vet offices, shelters and even some police departments so that their owners can be contacted and their kitties can be returned to their loving homes! Happy July 4th, everyone! Remember, we cats don’t like loud and startling noises. Some cats will leave their homes and yards in order to avoid the deafening sound of firecrackers and fireworks. Keep us inside and safe while you celebrate! Thank you for this informative post Maggie. And don’t forget, today is the last day to enter Phoebe’s 4th of July Giveaway. Hi everyone! We have a special post today about grief from Cat Scout Maggie. There is always so much loss in The Cat Blogosphere that she thought it would be helpful. Greetings, everyone! We’ve all experienced the loss of a special furiend, or friend. Aunty Ellen and we have been talking about grieving, so I’d like to share a few thoughts. Some of these are based on what our petsitting mom has shared with us, and some are from our own observations. I have not yet had to grieve, but my roommate Felix has done several times. 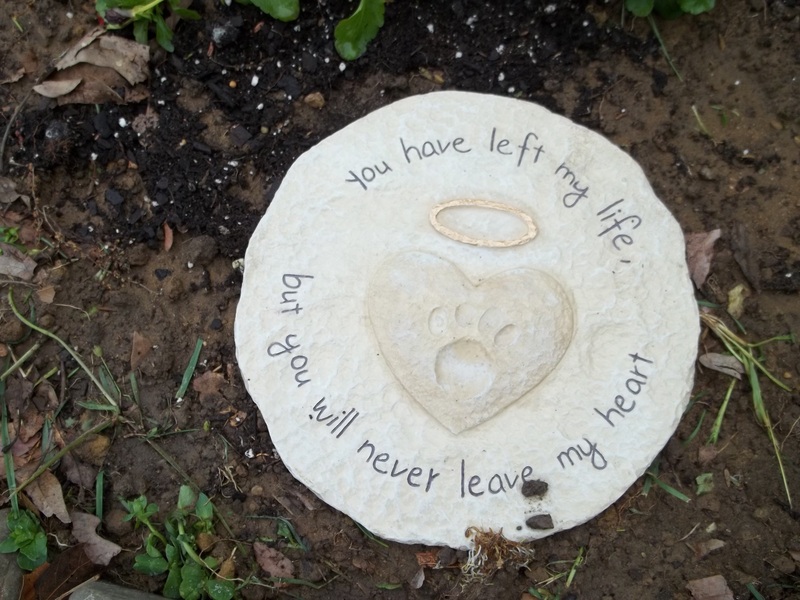 When our peeps lose a pet, they experience many different kinds of grief. If an animal dies suddenly from an unexpected medical condition or an unfortunate accident, our humans suffer the most, because the loss of their dear pet was a total surprise. In those instances, it’s important for us remaining pets to offer them lots of rubs and purrs so they know we are grieving with them. We must also expect that our humans might be a little aloof because they are not thinking about US at the moment, but about the departed one. This type of grief can take a long time to subside. In the case of a long illness, debilitating medical condition or just “old age,” grief takes a different form. Our humans have purrhaps started the grieving process ahead of time while the pet is still alive. Recognizing that the illness or condition will bring eventual loss may help our peeps cope more easily, and knowing that they can make the pet’s life more comfortable during the twilight time can bring much solace to them. When the animal finally passes on, our humans have had time to prepare and not feel guilty. We can really help at this time by just being as affectionate as we can, while not getting in the way. In some cases, when a pet has a diagnosed condition, our peeps can be in denial or not ready to “cope” with the added care, procedures and expense that might be called for. As the animal’s condition worsens, our humans can often panic or search for extraordinary means of “making things better,” when it’s probably already beyond their control. When this type of pet succumbs to its condition, peeps can often have a terrible grieving period because they feel guilty at not having done enough. They may regard us remaining pets with some anger or frustration, but our job is just to “be there” and be ready to love and be loved when our human is ready. When our peeps grieve, it’s important that they share their loss with special family and friends who are also animal lovers. This support group can offer a huge boost of love and energy when our peeps are depressed. Often, these good friends will send flowers, gifts or memorials of various kinds, and they all help ease the pain of loss. In our household, we are lucky to have adequate land for pet burial plots and commemoration areas. Our mom has always held a “wake” for a departed furiend, and the remaining pets gather round to pay tribute and last respects to their late colleague. Then, mom buries the dear departed pet in a special place in the garden. Friends have often sent floral gifts, plaques and even a weathervane to honor the lost pet. Holding a wake, if it is possible, offers a way for our peeps to grieve with us, and we with them. It allows a celebration of the departed one’s life, and helps turn that pet’s life into a pawsitive and happy experience rather than a frustrating, depressing or failed one. For pets who are cremated, it’s nice to also hold a celebration so that our humans and any remaining pets can commemorate the departed one’s life while not being able to still see or smell that dear pet. Some veterinarians and crematoria create “paw print” memory boxes so that our humans have something tangible to hold, touch and cherish in addition to their pet’s ashes. Many peeps find it healing and therapeutic to create a memory book of their dear departed pets. It can contain photographs, stories, comments from friends and admirers or whatever else helps celebrate the departed pet’s life and adventures. Bloggers have a rich source of memory material with which to honor their departed furiends. Grieving the loss of a pet is sometimes more acute than grieving the loss of another human family member or friend. Our peeps must know and feel that we grieve with them, and we also grieve for them when they are ill, bedridden, depressed or anxious. We pets help ease our humans’ pains, stress and worries, and we are grateful when they accord us the same honor as we age, get ill or meet an unexpected end to a glorious life. Grieving is an essential part of healing, and we in the animal kingdom sometimes understand this better than our humans do. Remember, rubs and purrs go a long way! Thank you Maggie for this excellent post. I just want to add 2 links to other posts on grief that are well worth reading. Dezisworld and Sonel’s World have both recently written about grief.